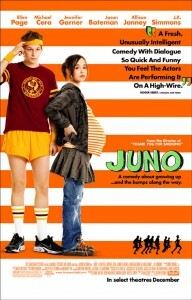 Juno is, in my decidedly non-humble and belligerent opinion, not only the most overrated film of the last decade, but also one of the worst. Before we go any further, let me assuage any accusations you might be formulating that I’m just trying to espouse an unpopular opinion for the sake of doing so, or that I didn’t want to like the movie: the second part is true. But I also went into Little Miss Sunshine (2006) expecting and wanting to hate it, and it won me over. I didn’t think it deserved to be regarded as one of the best films of that year, but I thoroughly enjoyed it. Let it also be known that I like all of Wes Anderson’s films (to varying degrees), The Squid and the Whale (2005) and Napoleon Dynamite (2004), so please don’t think I just hate quirky indie movies. That said, let me expound upon why this is the most insufferably cutesy and irritating film I’ve seen since Zach Braff’s Garden State in 2004 (and I think this one just might be worse).